...I can ask for your help. I have a billion ideas buzzing around in my head. The problem is I'm not sure which one to pick for further development. Sooo, help me out? Problem specifications: I want to have some sort of challenge where I can icon Farscape episodes (one ep/week, not more than a few icons per episode). Something interactive where I could discuss the episodes with others would be a big plus. Background: We have finally reached the end of the weekly club_farscape rewatches, and as far as I understand the plan is to start again from the beginning on Sunday. However, I've seen the episodes a gazillion times already so I'm not sure there's any point in watching them yet again, unless this time I have an icon challenge to go with it - the best kind of motivation. Soooo I'll need to come up with an idea asap. challenge with a specific friend or group of friends: everyone would enter each week and there could be discussion about the episodes too, something resembling this BSG rewatch post with vampire_sessah :) Pluses: it would be a fun way to collect everyone's opinions of the episodes, and quite motivating imo. I really like the prompts especially (favorite character, favorite scene and one AC for each ep, and clear schedules like this help me participate in a challenge regularly). Minuses: it's a pretty rigid structure and puts maybe too much pressure on each participant to enter every week (for me that's no problem but might prevent others from participating?). Only works if I can find at least one person to do this with! free-for-all, open challenges in my journal or froonium_icons: anyone could enter when they feel like it, no signups or anything. I'd just make a post each week, corresponding to the episode of the week, and anyone would be welcome to post icons of the ep (possibly for specific prompts like in the above suggestion?) Pluses: very flexible, it would allow for people to enter maybe only their favorite episodes, or to jump in in the middle, or drop out, or anything. Very low on pressure. Out of all these challenge types, this would probably work the best with other types of graphics too. Minuses: making a new post every week would probably feel like annoying spam to those watchers/friends who are not interested (or, in case we would use the same post each week, that probably wouldn't work very well cause everyone would probably just forget about the post altogether). making a few icons each week for some other challenge (maybe theiconquest quests?) with an added rule of only using caps from that week's episode: Another type of personal challenge I could do just on my own. Pluses: slightly more motivating than solution #1, cause at least the icons would be for something. I always plan on doing more for theiconquest and this would definitely make me do that. Other possible comms would be the7days whenever there's a more technical theme that can be used with any subject, and maybe even 20inspirations if I'd claim a Farscape season in some future round. Minuses: still noninteractive and depends a lot on my ability to find compatible challenges. Also this is a much more vague challenge structure than the others so I'm not sure I'd be able to follow it very efficiently, I like clearer rules and systems. creating a Farscape (icontest?) comm: each week there would be new prompts (I'm thinking three prompts and everyone could enter 1-3 of them?). 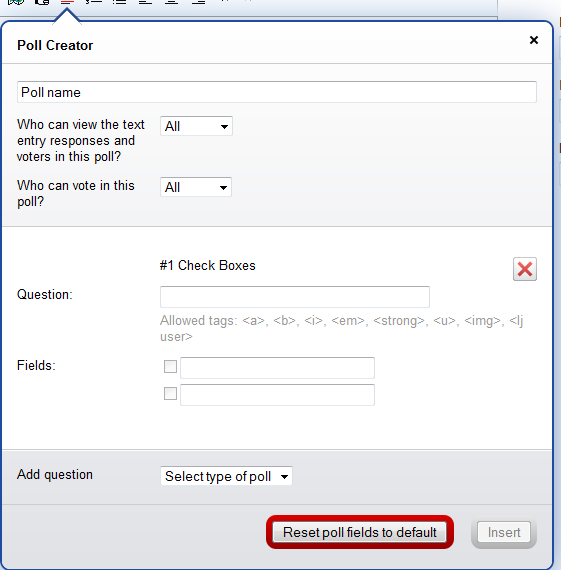 Could work with or without votings. Pluses: if this would take off, it would be a fantastic place for Farscape discussions and icons and possibly motivate even those FS fans who are too busy for farscape_20in20. It would allow for discussion with those FS fans who don't for some reason go to the chats, and that would be awesome cause I always love to hear new points of view. I could post cap samples there too so that even those too lazy to look for caps could participate, and when we'd reach those eps with no bluray caps yet I could definitely cap them too. 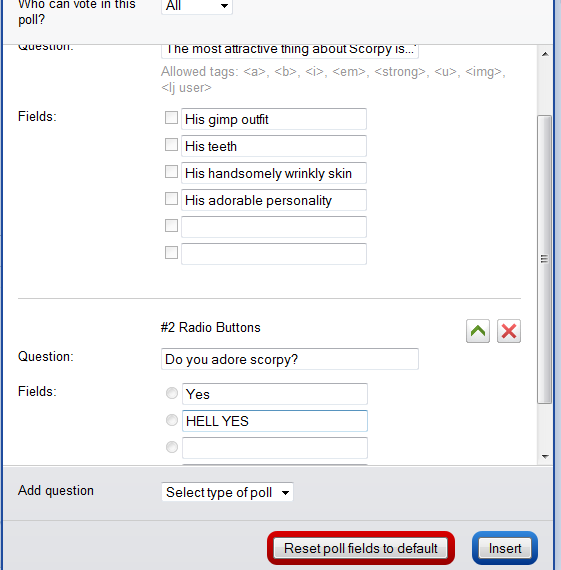 Minuses: this would require much more work than the preceding options, and there's a big possibility that this wouldn't actually interest people so I'd just end up iconing by myself in a comm and feeling silly. creating a multifandom challenge comm for episode-specific challenges, type A: a comm where you sign up for a rewatch with a specific show and then post icons and opinions for it as you go, anyone could set their own pace and also decide how often they want to post (a fast watcher could just post a set for a whole season in one post, while a slower one like me could just make a few icons each week). Due to not having deadlines or even any set structure, this comm could hardly have votings. Think of this as a multifandom, less scheduled version of #2! Pluses: this could be a really fun place for different fandoms to meet and for us iconers to get to know each other through the discussions. If it would be possible to have more than one show on the list, I could definitely take something other than Farscape too, maybe SPN since everyone apparently wants me to icon it/talk about it, so why the hell not :D Minuses: if there wasn't much interest, I could again just end up iconing there all by myself and looking silly. Or if this *would* actually take off, the place could get chaotic and difficult to run quickly, and I'd probably need a co-mod. Also, this would mostly just work for those who watch popular shows, as the less known ones probably wouldn't spark discussion. This might also very well become one of those comms that start strong but die quickly, especially if there were no deadlines. creating a multifandom icontest for episode-specific challenges, type B: This would work more like a regular icontest. There would be no claiming of shows so you could icon episodes of different shows each week. There could be weekly challenges and votings, if people want them. Pluses: the well-known traditional format would probably be easy to grasp and thus lower the bar to participate. It could be fun to icon several shows. 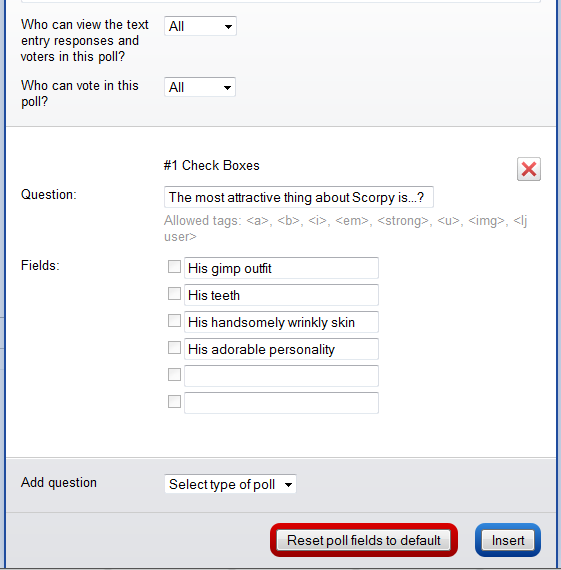 The format could easily be modified according to the interest of the participants, for example, it would work with or without votings, and with or without weekly prompts (if it's 'without' it could just have 'icon things you liked particularly much about the episode' as a general theme, or the same ones from option #2?). Minuses: difficult to run, though less chaotic than option #6 and would require less work from me than option #5 (because I obviously couldn't offer caps from every possible fandom so there wouldn't be any). Also, the multifandom angle wouldn't actually have any effect on me as I would still be iconing just Farscape, unless it was allowed to participate several times for each weeks challenge, so you could use as many shows as possible (which I still probably wouldn't do cause hey there are other challenges and I have to leave some time for those too! ), OR maybe a solution where you could icon different shows in one entry - say, I could participate with one icon from FS, one from SPN and one from Lost. Idk? So, obviously I still have a LOT to decide, and there's room for modifications in each of these so if one of these only half works for you, I'm really open to concrit. Also, I know some of these are explained in a horribly confusing and rambly way so if you didn't get what I meant with some of the options, please ask, I'd be happy to clarify! And just to clarify - no matter which option I pick, any possible comm would be free for all (=not an elite comm), and if I pick one of the Farscape options, participating would not require coming to the club_farscape chats. It would be awesome if you could fill the poll if any of these interest you at all! Please only fill this if you read the descriptions above cause the short descriptions in the poll don't really give a good idea of the solution. Which of these challenge types do you think would be the best? Would you be interested in participating (if so, in which of these - the numbers refer to the challenge types, read descriptions above)? Which of these would make you more likely to participate? Also I am most strongly behind an idea like #6 because it would allow more people to participate and use the comm as a platform for more interaction between iconmakers about their shows. Also II'm not a fan of votings for it. Argh I don't even know what I'm writing here, simply what I have going through my mind right now. Yay, I was hoping you'd reply to this, considering I kinda got the idea from our BSG rewatch :> Hehe, glad I'm not the only one that likes rewatch projects! Ooh, if I do choose #6 or #7, it would definitely be really awesome if you'd like to help a bit with the modding! Especially since you have quite a bit of experience too, and I love your suggestions! I didn't really explain #7 very well, sorry!! :D #6 would be more like the sort of 'rewatching project' you describe, you'd sign up for a whole round of reatching for a specific show you like and then post icons about it, while #7 would be more like a regular icontest with an episode theme. So 7 would have weekly challenges and votings like a regular icontest, but the point would be to use it together with a rewatching project so that each week's challenge would go with a different episode of the show you're rewatching. The prompts would have to be technical cause thematic ones probably wouldn't work with every possible show/episode. Whichever we choose, I'm thinking that the new entries would probably work best if they'd be posted in the icontest way (new entry with the icons + opinions, so that everyone could just reply to the icons and/or the opinions in a comment). This would also keep the comm active, instead of a more static one where people would have to track individual posts and reply to them with the icons. In our challenge this would have been impractial cause there are only two people making icons, but in a multifandom challenge with its own community this would probably work - what do you think? I think your idea about giving each season its own post is great, they could serve mostly as 'archives' where people could easily view all the icons made for a specific season. So, every time someone posts a set of icons, one of us would seek (or create) the season posts where they belong and insert them there. Oh yes, we would definitely need something that links to all the season posts (especially since we could only create them after people signing up with their fandoms). Great idea! Ooh, thank you, that is awesome to hear :> will keep this in mind!! First things first: since you managed to make the #@%$#@ poll work, please, please, prettyplease explain to me how it's done, because I could not do it! We have been talking about resurrecting FS_Land and I'd love for us to be able to do something again. 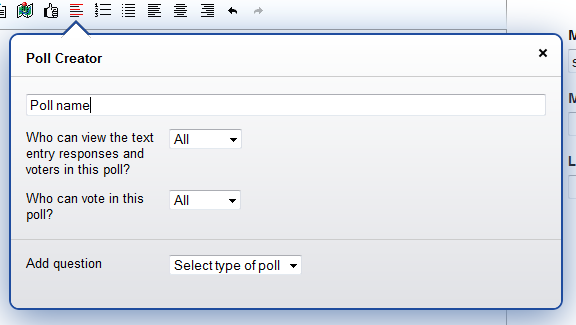 From the 'select type of poll' dropdown menu, pick which type of poll you want - if you want people to be able to pick multiple options, pick checkboxes, if not, radio buttons work better. Those are the two most commonly used types. 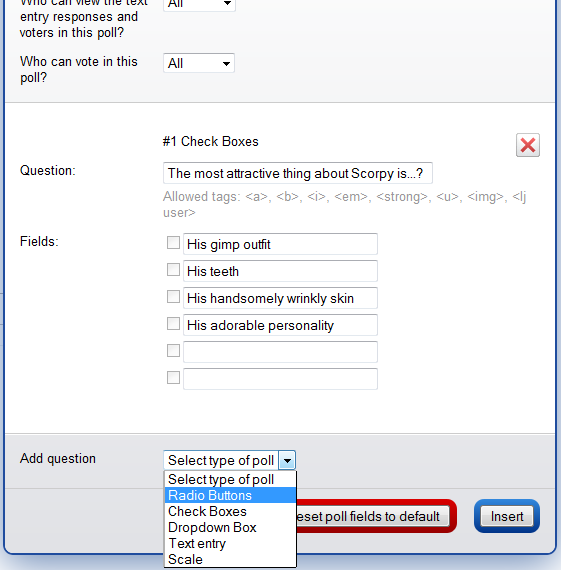 Now just start typing the first question, and then type the things to choose from on the 'Fields'. More of those fields should appear when you type, so you won't run out of them. and it doesn't show properly even if you click the preview button, but when you post it it actually works just fine. So, my mind was full of fantastic ideas from this post last night, and therefore I had to sleep on it because it's always better for me to sleep on ideas these days so I don't automatically go, "PICK ME, PICK ME!" I'm a huge fan of either #6 or #7 happening. Probably #7 more, simply because it's a little more relevant in terms of practicality, especially if you are looking to open the submission up to multifandom. If you went with something like #6 - limiting the fandoms would probably be necessary if you were planning on having discussions for the re-watch. But if it were purely icon related, I think you'd probably be sweet. You could probably create a monthly table of prompts, and people could fulfill them as they saw fit - so people who tended to re-watch faster than others (like me, as I have no life) could continue their challenge at the same progress as someone who watched one episode a week. Actually, now I've written that, I think #6 is most appealing to me. The bonus side of things could be a weekly discussion post for all participants, and people who were rewatching the same thing could link up - but that would also serve as a place for people to be all, "WATCH MY SHOW GUYS, IT'S FUN". In any case, I hope something multi-fandom happens because I've been itching to open my sisters Doctor Who DVDs and this is the PERFECT excuse! And now I will stop with words. Oh wow, thank you so much for all the fantastic input and ideas! Yep, I'm definitely leaning towards something multifandom now (also I'm thrilled to hear you'd consider picking DW - I haven't got a good chance to chat about the episodes that much so it would be fantastic to read your thoughts on them, not to mention seeing all the icons :>). #6 seems like the more popular option than #7 so something derived from the sixth idea would probably work best, but the idea of adding prompts to it is really good if we find a way to make it work with the free schedules (like, how many prompts would a monthly table contain? Cause that sets an upper limit to the watching speed doesn't it, so I wonder where the line should be drawn). Hmmm, good point about the discussions - I wouldn't like to limit the fandom choices (that would probably rule mine right out, haha! ), and now that I think about it I'm not sure how well fandom-specific discussion posts would work anyway, so I think your suggestion of having a weekly shared discussion post would be the only sensible way to go about it. There are still some details to be decided so stay tuned for another post soon! No great advice on which idea would work, but if you do some kind of community type thing, I would definitely participate as much as I can! Ooh, this is fantastic to hear! :D I'd love to have you on board. I like structured things too, they help me get something done, so whichever we choose there will be some structure (#3 was the most structureless of these and it's pretty much ruled out by now). It would be really awesome if this could inspire you to icon again, I really miss your stuff! I will do ALL THE THINGS! Erin and I are working on our own landcomm at the moment (Will be opening soon) but I would be all over doing something with Farscape or Farscape_land. More farscape is always good, so I wish the best luck for bringing fsland back! Oh, I don't think you need to worry, it looks like a Farscape icontest isn't among the options worth considering anyway! I'm leaning more towards something bigger and multifandom (mostly #6), so it wouldn't specifically compete with fs20in20, which I definitely haven't given up on! I just don't have the time to participate myself (a full set of 20 is too much for me atm, but 1-4 icons per week is definitely doable, which is why I'm planning another challenge here :>), but am willing to help out whenever you need it with the organizing and coding and stuff. Just feel free to PM me or something if I miss something important at the comm. Thanks for raising important points! I certainly don't mean to draw participation away from farscape_20in20! Yay, thank you for your interest! I think the option that looks the most promising right now is #6 (but possibly with prompts), so it definitely ticks all the boxes of 'episode based but with a more lax schedule'. I'm sorry to hear you miss the rewatches because of schedules :/ Hopefully the opinions exchanged through this sort of challenge would serve a similar function though!